About the sets: The coins in the 2012-PD Mint Sets were Uncirculated pieces pulled from regular production runs, thus the quality of the individual coins varies widely from set to set and even within a set. One example of each of the following from the Philadelphia and Denver Mints: El Yunque National Forest, Chaco Culture National Historical Park, Acadia National Park, Hawaii Volcanoes National Park, and Denali National Park and Preserve (all Copper-Nickel Clad). The four Presidential Dollars are Chester Arthur, Grover Cleveland (first term), Benjamin Harrison, and Grover Cleveland (second term) (Copper-Nickel Clad). The Native American Dollars commemorate trade routes in the 17th Century. (Copper-Nickel Clad). 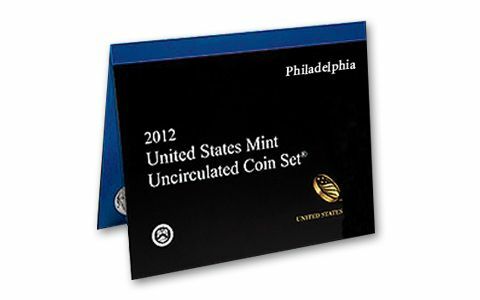 About the sets: The 2012-PD Mint Set contains five new issues in the America the Beautiful™ Quarter program. Perhaps most interestingly from a collector perspective, the four Presidential Dollars contained in the 2012 set include two different Grover Cleveland coins. Since he served two non-consecutive terms in office, President Cleveland has been honored with two different Presidential dollars. Original packaging: The 2012-PD Mint Set consisted of two different sets in two blister-style folders. The blue folder contains coins from the Philadelphia Mint, the red folder contains coins from the Denver Mint. Each folder contains the Cents, Nickels, Dime, Half Dollar, and Dollar, alongside the following five 2012 Quarters: El Yunque National Forest, Chaco Culture National Historical Park, Acadia National Park, Hawaii Volcanoes National Park, and Denali National Park and Preserve. Completing each folder are the four 2012 Presidential Dollars: Chester Arthur, Grover Cleveland (first term), Benjamin Harrison, and Grover Cleveland (second term). Barrack Obama elected to his second term as U.S. President. Encyclopædia Britannica, the oldest encyclopedia still in print in the English language, announced that it would no longer be producing printed versions but continuing online editions. Incumbent Governor of Wisconsin Scott Walker wins a recall election, becomes the first Governor in United States history to survive a recall. Hurricane Sandy's storm surge slams into the Eastern seaboard and causes destruction, especially in the states of New Jersey and New York. The 2012 Summer Olympic Games were held in London, England. During the Games, Michael Phelps became the most decorated Olympic athlete of all time, winning his 22nd medal. United States Consulate in Benghazi, Libya is attacked killing ambassador J. Christopher Stevens. On February 6, 2012, Queen Elisabeth II celebrated her Diamond Jubilee, which is the 60th anniversary of her accession to the thrones of the United Kingdom, Canada, Australia and New Zealand, and the 60th anniversary of her becoming Head of the Commonwealth.